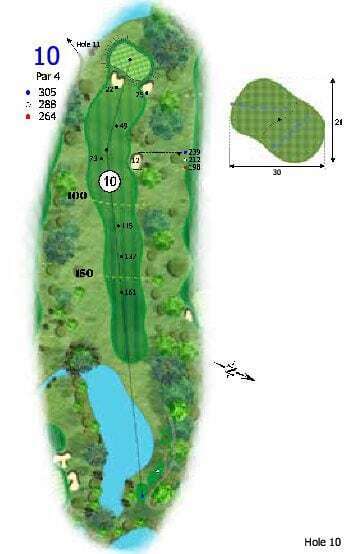 The tenth hole is strategic par 4 that can be played well or terribly should you miss place your tee shot. A fairway bunker on the right side with plenty of trees lining both sides of the fairway. The green approach is intimidating with two bunkers guarding the front creating a narrow entrance to an undulating green. With a water hazard to the rear you need to be accurate with your approach. This hole maybe short but you can leave you disappointed if you get into trouble. Safe Play: Lay up short of the small fairway bunker on the right, to make for a simple short iron into a well bunkered green. Aggressive Play: Hitting a very accurate driver left of or over the fairway bunker on the right will set you up with a small pitch shot and a chance for another birdie.